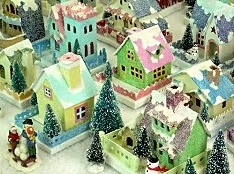 Folks who set out ceramic or resin collectible holiday villages today may not make the connection, but they are actually following a tradition that goes back at least to the Renaissance. 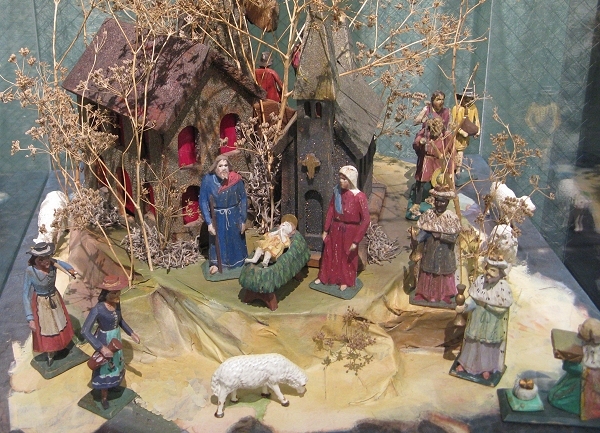 Each generation and several cultures and traditions have added to the mix, including European nativity displays, Pennsylvania's Moravian "putz" displays, and the toy train industry. If you enjoy setting out a holiday village of any kind, we think you will enjoy learning about the deep roots of this multicultural tradition. 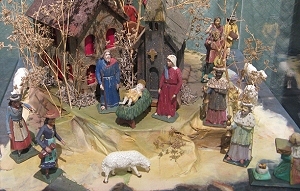 The earliest "Christmas Villages" were probably Nativity displays in homes and churches. Christians have been making and displaying statues that represent the birth of Jesus and the Magi's visit since the thirteenth century, if not earlier. In many cultures, it was common to add, not only shepherds, sheep, donkeys, camels, and oxen, but also "townspeople" in contemporary dress. For example, note the folks in "modern" Czech dress in this 19th-century Czech nativity from the University of Dayton's enormous nativity collection. 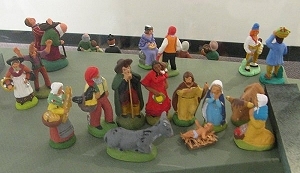 In Provence (France), nativities have long been adding figures representing nearly every member of the community. 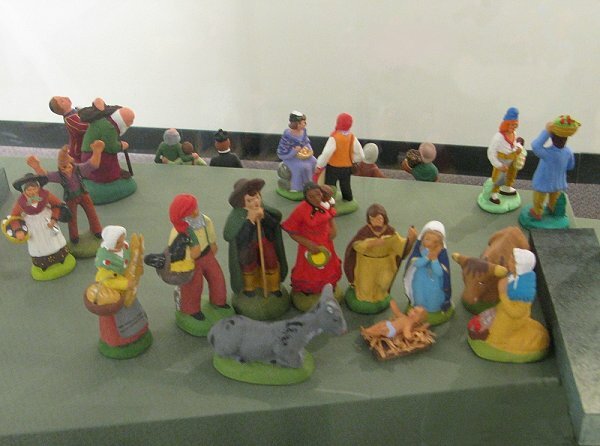 The University of Dayton's collection of these "santons," or "little saints" includes a gypsy, a tramp, and many tradespersons. Of course carving, painting, and arranging even the non-Bible characters were considered "devotional" activities. But it's obvious that for centuries, household nativities have been providing families with recreational and decorative outlets that are not so far removed from those of modern ceramic, porcelain, and resin villages. Many Roman Catholic families of North America have been setting up nativity displays since their ancestors arrived. My own mother told me that in the 1930s, her German-speaking father would set up elaborate landscapes and communities around the stable, a tradition passed down from his German Catholic immigrant parents. In our home, Mom would surround the stable with little fake trees and "frozen lakes" made of aluminum foil or small mirrors. But she would remark that her family used to set out much more "scenery." When I started doing a little research into related traditions, I realized that my Catholic ancestors weren't the only culture that built large displays around the Nativity. In areas settled by German-speaking Moravians, the seasonal "communities" were called "putzes," from the German word for "put," "set up," or "putter." 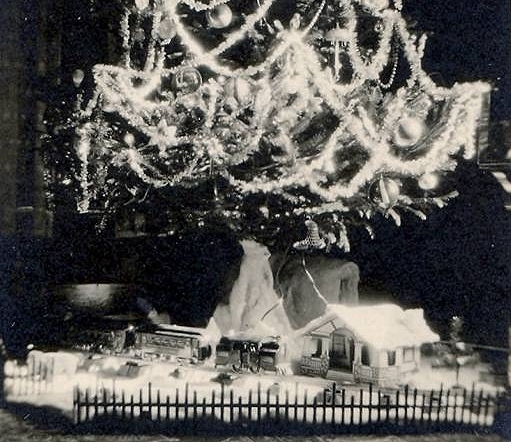 Moravian families (and eventually many others) would set out displays early in the season and tweak, or "putz around" with them right up until Christmas. Eventually those scenes included buildings, figures, and accessories that must have "clashed" in every way with the Nativity display itself. But quantity nearly always overrode such considerations as scale or era, and each family took pride in their ability to arrange an impressive display. In the late 1800s, putzes often included wooden or cardboard boxes shaped like houses. Originally, many of these came from Germany, like the candy-box house to the right. But by the early 1900s, the house-shaped cardboard candy boxes were coming in large numbers from Japan as well. 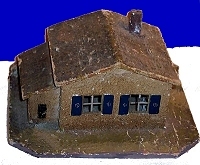 Since those days, these have been called "putz" houses by collectors, based on the use to which many of them were eventually put. In the late 1920s, some of the Japanese cardboard houses started arriving with holes in the back to accommodate C-6 light bulb strands. Soon, setting up illuminated villages with those little cardboard houses was a tradition in North American homes from many cultural backgrounds. 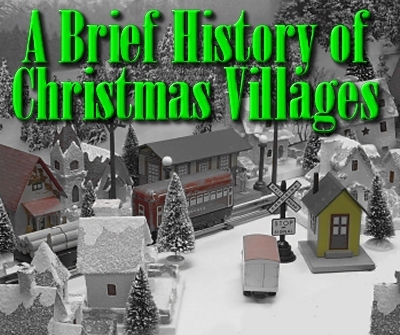 The third piece of the traditional Christmas Village arrived in the early 1900s, when toy trains that actually ran around a circle of track became available. In the early days, a good train set cost as much as a household appliance, so they were often given as Christmas presents. Once the presents were opened, setting the railroad up around the Christmas tree (usually the only clear spot left on the floor) seemed "natural." But next year, you had better believe that the train set went up before Christmas Day, sometimes weeks before. 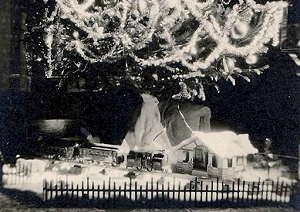 Many seasonal railroads started as an extension of the Christmas tree route, like the unlabeled 1920s-era photo to the right. But many grew to take over parlors, spare rooms, and back porches. In devout homes, the nativity might come first, but then trains and other town pieces would be added, usually with no attention to scale or time period. The toy train companies made buildings and accessories were made by the toy train companies, using the same kind of tinplated steel that they used for their trains. Other companies, made buildings, not only from tin, but also from cardboard that was heavily shellacked to look like tinplate. Soon Christmas tree railroads had assimilated the structures and accessories from the "putz" tradition. 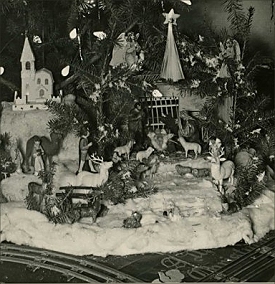 Toys (such as farm animals) and Christmas decorations (such as reindeer and Santas) often found their ways to the display as well. 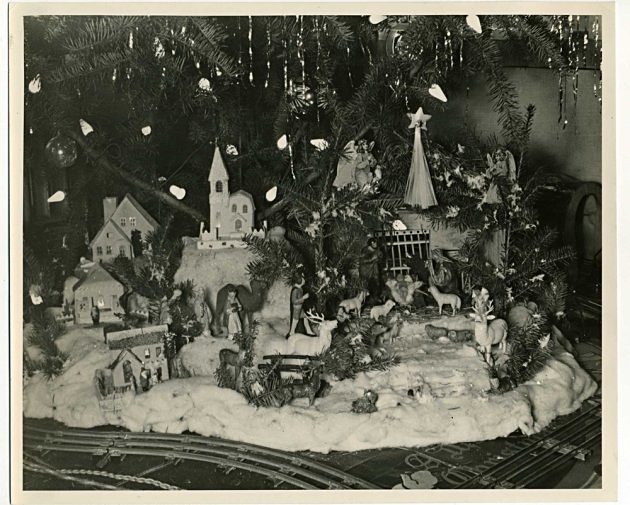 In many homes of the 1920s and 1930s, it would have been impossible to tell whether the family Christmas display started with a railroad, a nativity, or a putz village - the three were so intertwined. Sadly, by the late 1960s, many factors had made large, month-long Christmas displays of trains and towns impractical, or at least outmoded for most families. Trains were getting too small to put around the tree, houses no longer had parlors, and living rooms were being permanently rearranged into shrines for the television sets. In addition, nativities were going out of vogue in an increasingly secular society. So the "troika" of trains, towns, and nativity displays was broken, apparently for good. Those shiny, snow-dappled buildings were the start of a series that Dept. 56 now calls the "Original Snow Village®." It wasn't long before Dept. 56 added more buildings, nor before imitators sprung up. Soon folks across North America were setting up holiday village displays much like their grandparents did, although the results weren't as eclectic as earlier displays - many families restricted their displays to items manufactured by Dept. 56 (and sometimes by their imitators). In 1984, Dept. 56 introduced its "Heritage Village Collection®," which now includes several "series" such as "Christmas in the City®." The Heritage Village buildings are made of porcelain, not ceramic, and tend to be a little less "cutesy" than the "Original Snow Village" buildings, but they attracted a new crowd of collectors and imitators. 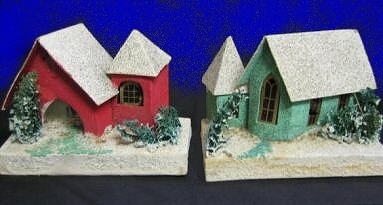 The folks who run the Bradford Exchange soon introduced the Hawthorne Village® lines of collectible villages that resemble the Dept. 56 Heritage Village Collection® series in several ways. Though the earliest villages were ceramic or porcelain, later villages depend more on resin. Resin structures use painted-on finishes instead of baked-in glazes like most Dept. 56® buildings. Still, using resin allows more fine detail to be shown and faster development time for new collections, which Hawthorne Village® churns out at an astonishing rate. As an example, they are currently making at least eight village collections based on the work of artist Thomas Kinkade®, eight Halloween-themed collections, and dozens more. 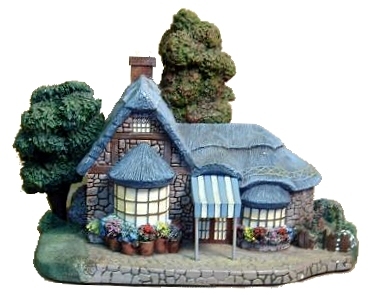 The building to the right is from the Thomas Kinkade Lamplight Village® collection, one of Hawthorne Village's most popular. An even bigger difference between Hawthorne Village® and Dept 56® is that Hawthorne Village collections are sold almost exclusively through "subscription." That is, you buy the first in the series and order the rest, and you get and pay for one piece about every four weeks. Although this confuses some buyers, most folks who get the first one like it so much they stay subscribed for several more pieces, if not for the rest of the series. In 1990, Lemax began offering a collection of lighted houses. 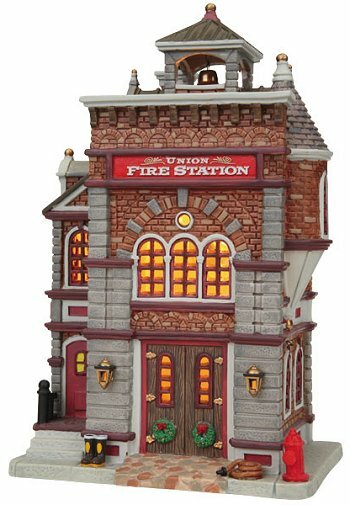 Although most of their early collections offered typical Victorian Christmas village buildings and accessories, they have also added extensive circus, seaside, north pole, and Halloween collections. A number of folks try to gather complete collections, which can be a challenge because Lemax also sells different items through different channels, including department, craft, and hardware stores. Lemax structures are often just a bit larger than similar Dept. 56 or Hawthorne Village buildings, although they follow the Dept. 56 example of keeping different buildings close to the same size by shrinking buildings that "should have been" bigger, and enlarging buildings that "should have been" smaller. Most Lemax products are very well designed and a good value. However, quality control issues often affect details like the faces of figures. So if you are interested in a Lemax figure or accessory, you may want to compare two or three to get the one with the most consistent paint job. 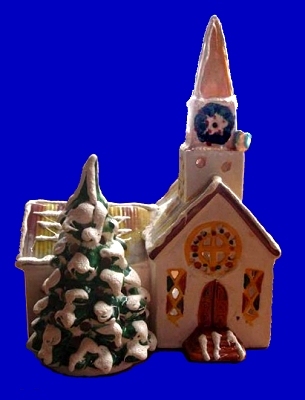 Since 1976, many other companies have gotten in and out of the ceramic Christmas village business. One company with longevity and gradually improving quality is the Kohls® department store chain. They have sold privately contracted ceramic and resin villages and accessories under the name St. Nicholas Square for several years. Many of the buildings and figures look like they came from early-to-mid twentieth-century North America. The St. Nicholas Square designs are not generally quite as large or quite as original as Dept. 56, Hathorne Village, or Lemax collections. However, their quality is more consistent than most of the "off-brand" products and seems to be improving each year. 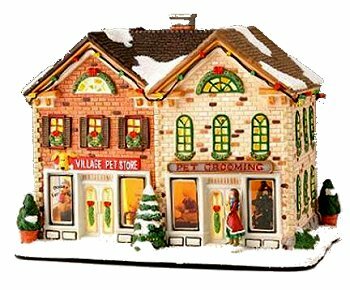 Many department stores, hardware stores, and specialty stores (including Jo Anne fabrics) bring in ceramic village houses to sell before Christmas. In some cases the accessories are actually Lemax products rebranded for a house brand "collection." In most cases the quality of the house brand "collections" is a little lower, and sometimes much lower even than St. Nicholas Square. Hardly anybody actually collects these self-labeled "collections" the way they do the better brands. On the other hand, I almost always stop and look; you never know when one building or accessory will take you by surprise or somehow supplement your "official collections. And I often see both die-hard village collectors and model railroaders doing the same thing. I have to confess that I currently have more ceramic, porcelain, and resin buildings than I'll ever have room to set up at once, and I'm not even a serious collector. But one thing that gets me excited these days is that the Christmas village/putz/Christmas garden tradition is starting to come full circle. Not only are fans of putzes, like "Papa" Ted Althof, studying and restoring the vintage "putz" houses. But a rapidly-growing circle of folks interested in these traditions are getting back to "roots" by building their own projects. Some of our sister sites have been able to support this growing hobby by providing free, downloadable plans, graphics, and instructions for dozens of inexpensive, easy projects on our sister sites. Here are a few starting points. Designer Howard Lamey has begun making all new "glitterhouses." We've been helping Howard give other folks the resources to create their own vintage cardboard communities. If you like the idea of getting in touch with your "roots" and setting up a brand-new, sparkly, but traditional Christmas village, take a look at our article "What is a Glitterhouse?" Folks who are rediscovering their toy train roots are also figuring out how to make "new and shiny" tinplate-style buildings and accessories for an expensive, but impressive vintage look in their own villages and railroads. Check out our Tribute to Tinplate™ articles for many more free, unique resources. And contact us with any questions or suggestions you have in the meantime. Notes on Dept. 56® Village Collections - Additional information we didn't have room for in this article. Notes on Hawthorne Village® - Additional information we didn't have room for in this article. Dept. 56® Village Trains. - A review of train sculptures and electric trains that have carred the Dept. 56 logo®. What do Trains Have to do with Christmas? 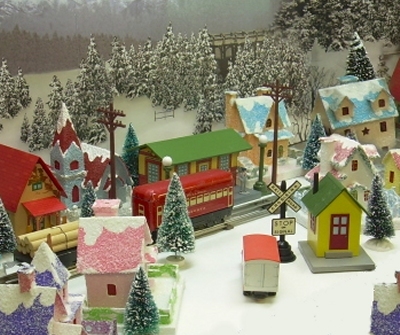 - Real, toy, and model trains have been associated with Christmas for a century and a half. How did that association start, and how has it affected our Christmas celebrations over the generations? "Papa Ted's Place" - Ted Althof's extensive resource about vintage pasteboard houses. It includes history, many photos from other people's collections, and resources to help you build your own. Ted was a train collector who came across as set of these a few years ago and wondered if anybody had ever bothered to do serious research on them. So he started asking questions and assembling the answers people gave him into a series of web articles. Although the result is a work in progress, it is by far the best single resource I have found on this topic. If you want to jump right to some GREAT photo pages, try this link. I hope you have high-speed internet because there are a lot of photos on this page and the following ones, but they are inspiring as well as inspirational. Antoinette Stockenberg's photographs and comments on putz houses and life in general. - This is an entirely different kind of site from Ted's, but first class in every way. Antoinette is a published novelist who started decorating her home with putz houses some years back, started learning about the hobby, and the rest is history. She populates her putz with period-appropriate accessories, including "flats," inexpensive vintage figures made like tin soldiers. She also writes some nice articles about her putz villages and other subjects. The above link takes you to her home page, which usually has great photographs of her mantle-top putz. Be sure to look at previous years' pages to see other buildings, accessories, and arrangements. Halloween Village Manufacturers - The same folks who make the best Christmas villages are also making some pretty interesting Halloween villages, including some family-friendly ones featuring Winnie the Pooh and much, much more.